With that said, if there is a specific person in a specific scene that I want to photograph, I will of course ask them. Then, it is my job as a photographer to get them to feel comfortable in front of my lens and to gentle persuade them into a natural pose as quickly as possible. 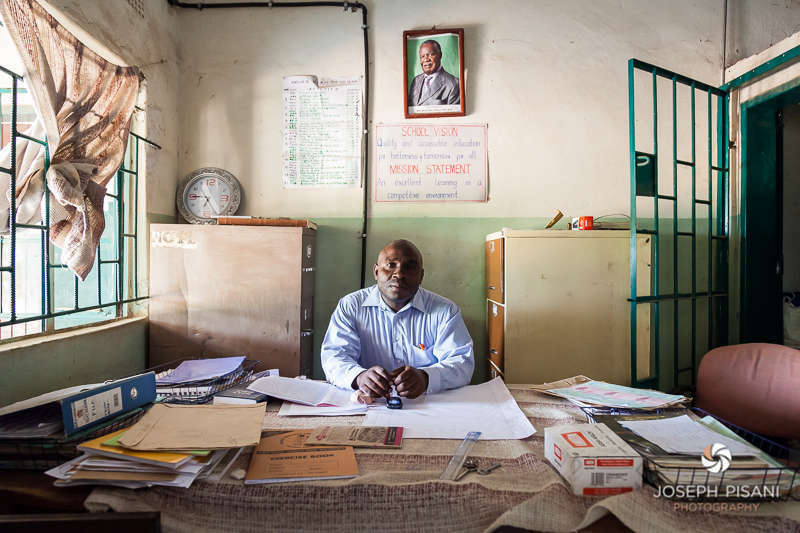 That was the case with the above photo of headmaster at a small schoolhouse in Zambia. When I saw his vacant office while visiting this rural schoolhouse, I just knew I had to find him and get him to sit at his desk for me. Making your subjects feel comfortable in front of your lens is probably the most important job you have as a “people” photographer. Talking to them, making them feel at ease, telling them how great the photo is going to look and smiling can do wonders. Also, don’t forget to show them a few of the photos on the camera’s display to instantly win some new friends when you’re done. In the barber shop photo below from Kathmandu, Nepal, I rather boldly poked in with a big smile and asked if I could take a few photos–they were more than happy to oblige. Assuming the sale (in this case, a positive reply) often really helps. Additionally, to try to overcome any unnatural stiffness in your subjects, take a couple shots and then wait and chat a bit until your subject loosens up again–then, when they think your are finished, they normally will ease up–then start snapping! 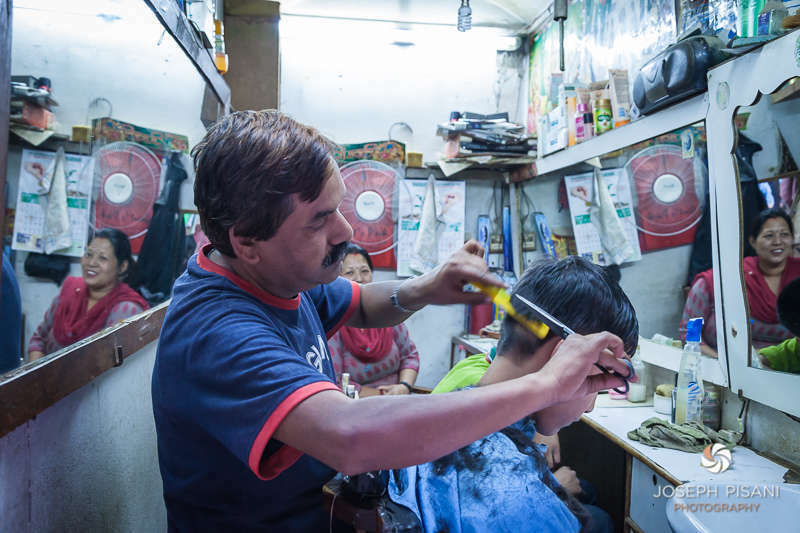 If I hadn’t been a bit bold and asked, I would never have gotten this great photo at this shoe box sized barber shop in Kathmandu, Nepal. I am all for optimizing my time spent taking photos while traveling. There are just too many great things to do and experience in each new place I visit. So, the last thing I want to do is have my eye forever glued to the camera’s viewfinder. However, I still do want to make some great images each place I visit. If you want to maximize your photography time spent, make sure to utilize the short span of time about 30 minutes before and after both sunrise and sunset. This time is also know as the “magic light” or “golden hour”. Over the years, I have even started to only shoot travel photography at these times, and I am quite sure I am not missing out on much. All too often, I end up hanging out and waiting for the Magic Light to arrive, only to watch in bewildered amusement while most of the other tourists disappear right before the magic arrived. Beautiful light with vivid colors and nobody getting in the way–what more could a photographer ask for? Early mornings are also great for crowd control. 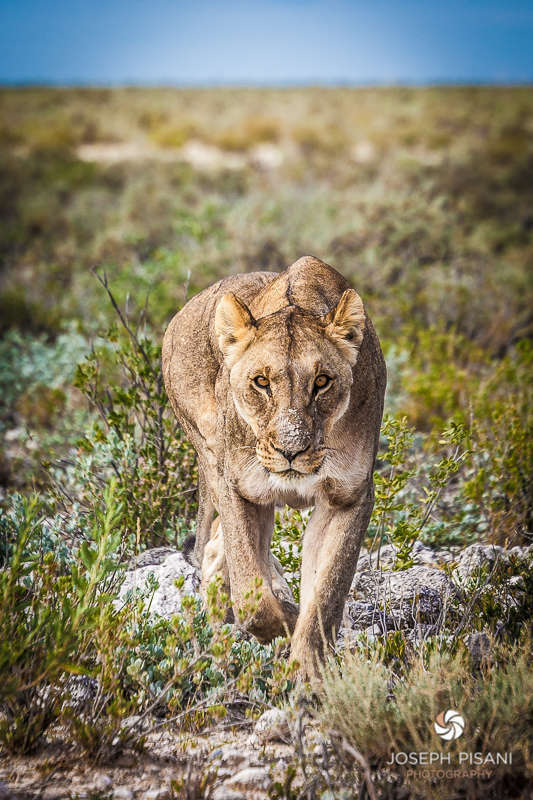 Caught this lioness hunting in the morning “Magic Light” at Etosha National Park in Namibia. 4. Know the Rules & Don’t go Blind! Make sure to keep a few basic photography rules about composition in mind when lining up your shots. For example, by using leading lines, frames, the rule of thirds, and positive and negative space, you can greatly improve on your travel photos. To apply this, make sure to follow this tip: When you see a potential shot, after looking through the lens, take the camera away from your face for a second and survey the scene around you again. This simple step should help to avoid what I call “viewfinder blindness”. By adding this little step, you just might end up noticing something that could help turn a potential good shot into a great one. Additionally, try the same shot from a few different perspectives. Often, after I make my initial shot, I will think about how I could photograph the same scene in a different way. Often, these later photos are much better than the original one. 5. Cliché is the Death of the Photographer: Be Different! This is a continuation from the “Don’t go Blind!” rule above. For starters, this rule is especially true when you want to take a picture of a famous landmark or icon that has already been amazingly overshot for decades. Often, you will see somewhat the same exact photo again and again when it comes to something like the Pyramids of Giza, etc. Sure, take that shot, if you really must, but don’t miss out on the potential for the new and exciting. Again, take a step back, get down low, or up high, anything different, then attempt to capture that old landmark from a new perspective. Don’t be afraid to try something outlandish in order to get the shot, as long as you don’t jeopardize your safety in the process. Personally, I will climb (not always allowed, but if you don’t ask…), or lie on the ground, or whatever else I can think of to get the shot. I am long immune to the many strange looks I often get from others wondering what in the world I am doing as they go about making yet another magnificently cliché photograph. With that said, be careful not to get run over, or loose your footing in the process–looking around and being aware of your surroundings is essential while making great travel photos. For example, in the photo on the boat above, I had to crawl out on to the rickety bow, with nothing to hold on to, and no railing–however, it meant a great photo where there was otherwise none. I’ll take those odds–just make sure you know the odds through awareness before doing anything unintentionally stupid. Travel Photography Rules of the Road, Part Two is coming soon. In the meantime, have a look at some of the other moments I captured along the way in my Travel Photography section or, view the Abstract Paintings these photos inspired. And, don’t forget to leave a comment about some of your own favorite travel photo tips. Really cool photo tips. Thanks a lot. I’m headed to Turkey soon and will def. try some out. Man, that looks like a job! Super Seitе, ich komme mal wieder vorbei.